According to researchers at Parks Associates, consumers are not only showing a preference for on demand streaming video over other alternatives, but also paying close to $50 per subscriber to access premium services. That trend isn't likely to reverse itself any time soon, considering the growing tablet market and demand for increased access to content across platforms and at any location. Estimates from the NPD Group's Connected Intelligence division suggest demand for access via Wi-Fi hotspot or even across mobile data networks, could equal demand for access in the home. The broad appeal of subscription services is coming, in part, at the expense of a la carte rental and purchase services. Apple recently got rid of their $0.99 TV show rentals. DVD and Blu-ray sales and rentals have been stagnant for some time, with Blu-ray adopters generally failing to make up for lower DVD revenue. At the same time, consumer willingness to drop pay TV subscriptions in favor of internet options is on the increase. The logical move at this point would be to concentrate on helping online services profit in the new marketplace to make the transition profitable for everyone. The same consumers studios are counting on to ensure disc formats remain viable are getting online video clients built in to their HDTVs and Blu-ray players, to say nothing of the video capabilities and additional options available for modern game consoles and tablets. 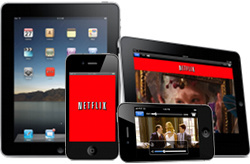 This shift will create havoc with today’s well-understood TV revenue model potential. All players want a piece of that revenue, but not all players will hold their current positions over time. But studios continue to focus alternately on handicapping streaming services and demanding payments from them based not on actual revenue, but rather the perceived cost of consumers abandoning legacy platforms. What they should be thinking about is the revenue gained when online viewers choose pay services rather than illegal (and unprofitable) alternatives. Internet video options don't directly match up to legacy products and services. They are completely different markets, each with its own inherent limitations and advantages. Online video can not be assumed to work like disc rentals, nor is it analagous to subscription TV. Certainly it's not comparable to disc sales. Likewise, limiting oniline video doesn't necessarily make it less competitive against TV or disc rentals. It does make profiting from that competition much more difficult. Where do they find these people? I don't know ONE person that would rather stream a pixelated streamed movie over watching a High Def Blu-ray. Over my phone, yes i wouldn't mind streaming, or a cloud service where i could watch my own content. But on my TV at home, it's blu ray or nothing. It all depends on your internet connection...a lot of people are fine with DVD, and Netflix sometimes looks better than a DVD with a good connection. The fact is that most people didn't really care that VHS looked like crap...they got the general idea of what was on the screen and they were entertained. This is the main thing that people want...they will pay more for higher quality, but not much more...and they generally won't go out of their way for it (streaming is convenient). No interest in Blue-ray at all here. I love the convenience of streaming. If all movies and TV shows were available streaming I would only stream my entertainment. I stream virtually everything. Most of the time it looks great. Once in a while net flix gets slightly pixilated. I would rather pay for the content I actually watch than all of the other channels that I never watch. The one thing that is missing is some of the live events I like to watch, IE football and bowl games. Get me those few things and my cable is gone. I think alot of it has to do with the sheer amount of advertisements you have to sit through with regular cable (unless you dvr). Depending on the program it seems roughly 25% of the time your watching commercials, and its getting worse. How many auto insurance commercials for example can you sit through? If your fish seems sick, put it back in the water.